Salome was the daughter of Herodias and Herod Philip I, one of the sons of Herod the Great. Her name is the feminine form of “Solomon” and means “peace” or “peaceable.” The two Bible texts where she is mentioned refer to her as “the daughter of Herodias” (Matthew 14:6, Mark 6:22). Josephus, the Jewish historian, confirms that her name is Salome, in his account of Herod’s troubles with John the Baptist. She is remembered in connection with John’s murder. Josephus states that Herod Antipas imprisoned John the Baptist for political reasons. Herod feared John’s growing influence in Judea and his potential to stir up a rebellion. John’s preaching drew crowds of believers who looked for the Messiah. As John’s work prepared the way for Christ, he made strong demands for repentance. His bold pronouncements against sin put him at cross-purposes with Herodias. Herodias had divorced Salome’s father, Herod Philip I, to marry his brother, Herod Antipas. Antipas divorced his wife and made Herodias queen in her place. However, John had more than once told Herod, It is not lawful for you to have your brother’s wife (Mark 6:18) and condemned the marriage as incestuous. This rebuke threatened Herodias’ position, and she hated John for it. The Bible states that Herod imprisoned John for his wife’s sake (Matt.14:3), and Josephus cites the additional political reasons that also figured into his action. Herodias was not satisfied with John being in prison. She wanted him dead but Herod “feared John and protected him, knowing him to be a righteous and holy man” (Mark 6:19-20). After some ten months, an occasion for revenge presented itself at Herod’s birthday banquet. Edersheim places these festivities in early spring, “before the Passover, the anniversary of the death of Herod the Great and of the accession of (his son) Herod Antipas to the Tetrarchy.” Herod gave a banquet for his officials, military officers and leading citizens. As part of the entertainment, “the daughter of Herodias came in and danced [and] she pleased Herod and his dinner guests” (Mark 6:22). As a reward for her performance, Herod granted Salome an extravagant gift that ended in John’s murder. How old was Salome when she danced? What kind of dance did she perform? Was she a co-conspirator or an innocent pawn in John’s beheading? Historians present both sides. 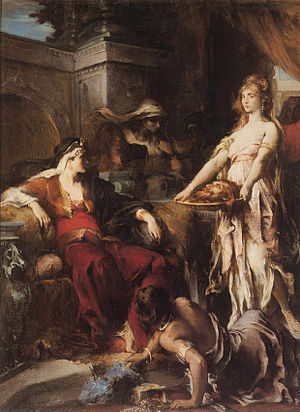 Noted scholars Alfred Edersheim and Herbert Lochyer portray Salome as a seductress in league with her mother. Her dance, they believe, was a brazen, sensuous trap planned by Herodias. “The evil heart of Herodias planned the evil act of Salome’s dance, and God’s greatest prophet died.” Oscar Wilde in his play Salome and Richard Strauss’s opera adaptation of it reinforced Salome’s sensuous reputation by including the “Dance of the Seven Veils,” a suggestive shedding of veils performed to arouse lustful passion in King Herod. Youthful exuberance or provocative passion? The Expositor’s Commentary strikes a middle ground in saying that the dance “may have been very sensual, but the text does not say so.” John Gill comes down on the other side and states that Salome’s dance was “cheerful” and the “airs, gestures, and motions…were so extremely fine and regular, that she gave wonderful satisfaction and delight to Herod, and the whole company.” Those who favor a more encouraging picture of Salome state that the Greek word used for “dance” is the same word used in the Bible for children dancing in street games. Salome entertained her stepfather and his guests with a dance performed artistically. As a father, Herod was pleased that his stepdaughter had performed well. These scholars also cite the word korasion, a diminutive form of the Greek word kore that means “girl.” Salome was a korasion, a little girl, perhaps pre-puberty. She may have been a small child or possibly a little girl of eleven to thirteen. A supporting text shows that Salome was still dependent on her mother’s guidance. She was unprepared to answer Herod’s offer of a reward “up to half the kingdom.” She didn’t know what to ask for and had to be “prompted by her mother” (Matt. 14:8). In other words, Herodias didn’t have a plan until Salome said, I don’t know what to ask for, Mother. I lean toward Salome being a young girl who danced with youthfulness and pleased King Herod. I think it probable that Herodias snapped up Herod’s offer to Salome. She compelled her daughter to do the dirty work of asking for John’s head. She forced Herod into a decision he couldn’t retract. Shortly after John’s beheading, Antipas arranged for Salome to marry her great-uncle, Philip the Tetrarch. The couple was childless, and Philip died within about two years. Salome then married her cousin Aristobulus of Chalcis. 1 Complete Works of Josephus, XV111 v. 4.